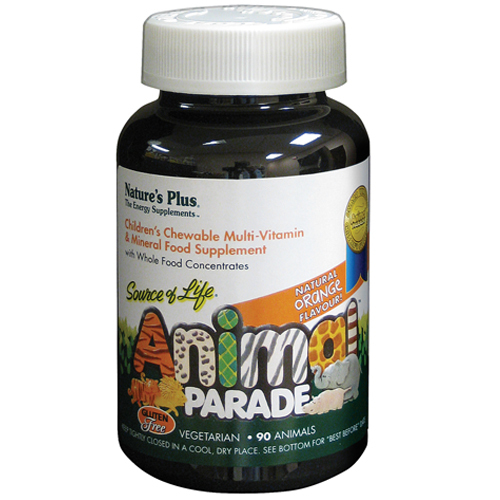 Nature`s Plus Animal Parade Multivitamin & Mineral children`s formula supplies the protection and nutritional assurance all parents seek for their children, along with the great taste of orange and animal shapes that kids love. Fruit and Vegetable Blend (annatto, turmeric, apple fruit, pineapple fruit, rose hips, whole brown rice, papaya, kelp, carrot, broccoli, spinach, mango fruit), natural flavour (orange), citric acid, binding agent (guar gum), lubricant (stearic acid), fructose, calcium (as citrate; aqueous-blended calcium carbonate and hydrolysed rice protein; tri-calcium phosphate), ascorbic acid, d-alpha tocopheryl acetate, magnesium (as citrate; aqueous-blended magnesium oxide and hydrolysed rice protein), beta carotene, niacinamide, sunflower oil, iron (as ferrous gluconate; aqueous-blended ferrous sulfate and hydrolysed rice protein), lubricant (magnesium stearate), calcium pantothenate, natural colour (curcumin), non-GMO maltodextrin, zinc citrate, pyridoxine hydrochloride, riboflavin, biotin, thiamin hydrochloride, potassium citrate, ergocalciferol, cyanocobalamin, copper citrate, manganese citrate, potassium iodide, choline bitartrate, folic acid and inositol. 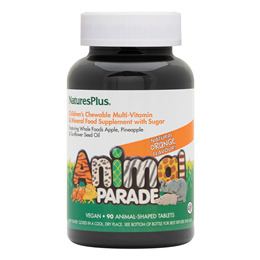 Below are reviews of Nature`s Plus Animal Parade Multivitamin & Mineral 90 Orange Chewables by bodykind customers. If you have tried this product we'd love to hear what you think so please leave a review.